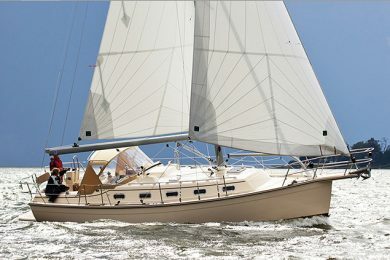 I’ve had the good fortune to sail Hylas yachts many miles, particularly the 54 that became the company’s most popular and successful model. The Hylas concept has always been to offer good, modern cruising boats for couples that provide a lot of boat and high quality for a good value. 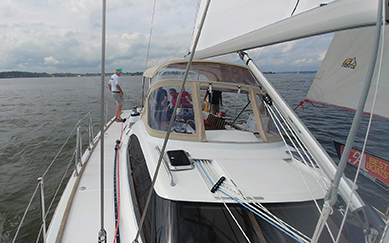 Right after the 48’s debut at the Annapolis sailboat show, I got a chance to take it for a sail. Climbing aboard from the dock at Mears Marina in Back Creek, you could tell at once that the design was a good old-fashion, medium-displacement cruiser that was destined for blue water sailing. She just felt solid underfoot. The 48 was designed by Englishman Bill Dixon who has spent the last 30 years designing luxury, mega-sailing yachts for the rich and famous. 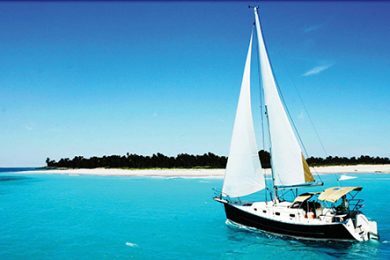 His boats are known for their fine seakeeping qualities, their elegant looks and attention to traditional details. 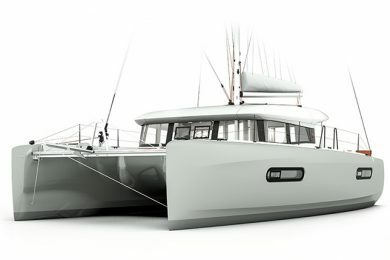 The 48 is very much in the Hylas family of designs with a raised saloon, center cockpit, large aft cabin, open plan saloon and a simple roller furling cutter rig. The 48 looks very salty because it is very salty. We were lucky enough to have a bit of wind on the morning we took the 48 out for sea trials. Not a lot of wind, mind you, but at least eight knots with a little more in the puffs. 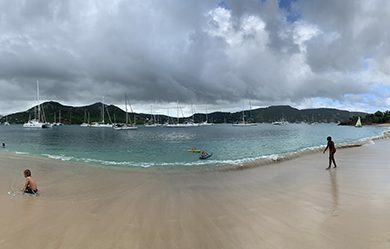 We cleared the docks and headed down the creek to the bay. The engine is right underneath the center cockpit, right below your feet, but as we motored and then tried the boat at higher revs, there was almost no vibration underfoot and very little engine noise. 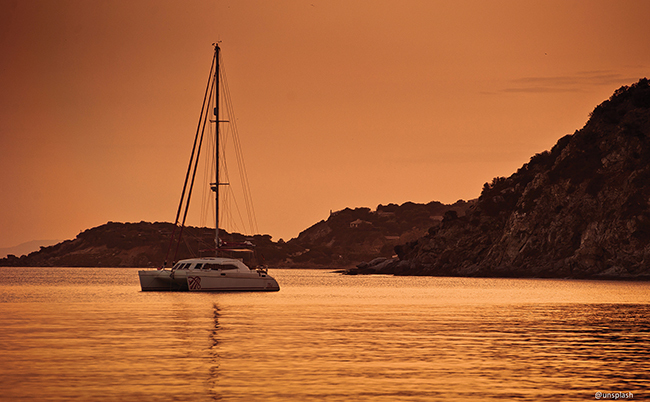 This mechanical silence is a hallmark of a luxury, well-built yacht. 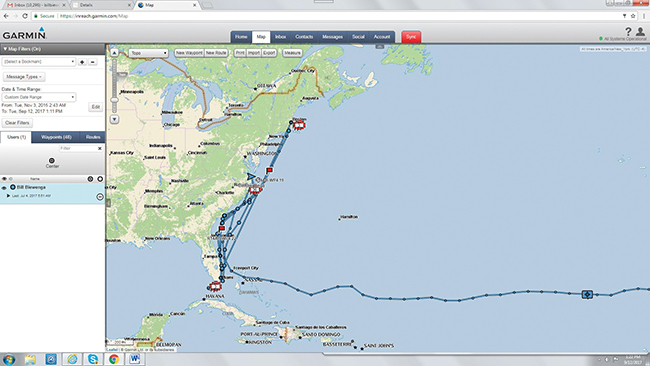 At 2300 rpms, the 48 cruised along smoothly at seven knots while at full revs of 3300 rpms she got up to 8.5 knots. Even at high revs there was not much cavitation on the prop or vibration on the rudder. 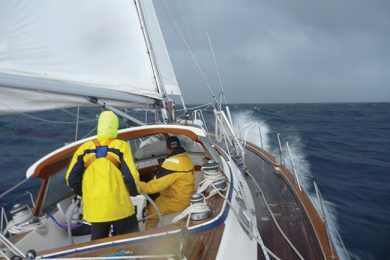 Once out into the bay, we headed into the breeze so we could roll out the mainsail from the mast. 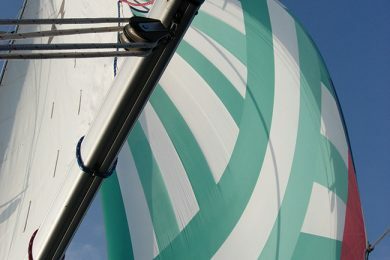 The sail has three vertical battens which allow the sailmaker to give the mainsail a slightly positive roach and thus a little more sail area than a batten-less main. We fell off the wind and rolled out the 135-percent genoa and trimmed for a close reach that would take us out into the bay. The helm felt light and the steering linkage very smooth. The boat has a fairly large rudder so she handles easily. With the sail trimmed, the 48 gradually gathered speed and was soon sailing at five and a half knots in the light breeze. You could feel how well the design tracks and holds its course, so it will be easy for an autopilot to steer, even in bouncy weather, I suspect. We put the 48 through a series of tacks, which were made easier by the use of the electric sheet winches. In the light breeze the boat tacks in just over 90 degrees and carries her speed well through the tacks. 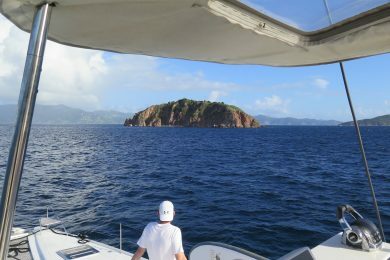 In a medium displacement cruising boat like the 48, many skippers would motor sail in these light conditions; with only 1200 rpms on the engine, we got her cruising upwind with the sails full at 7.5 knots. As we headed back to the docks, we eased sheets and jibed our way downwind. At 160 degrees off the wind, the 48 nipped along well and it was easy for two people to handle the jibes. Again, in the breeze we had, an assist from the engine makes a huge difference while burning very little fuel. The center cockpit seats six comfortably and all lines and sheets are accessible. The boat we sailed had a dodger and full Bimini over the cockpit, so we were well protected from the elements. 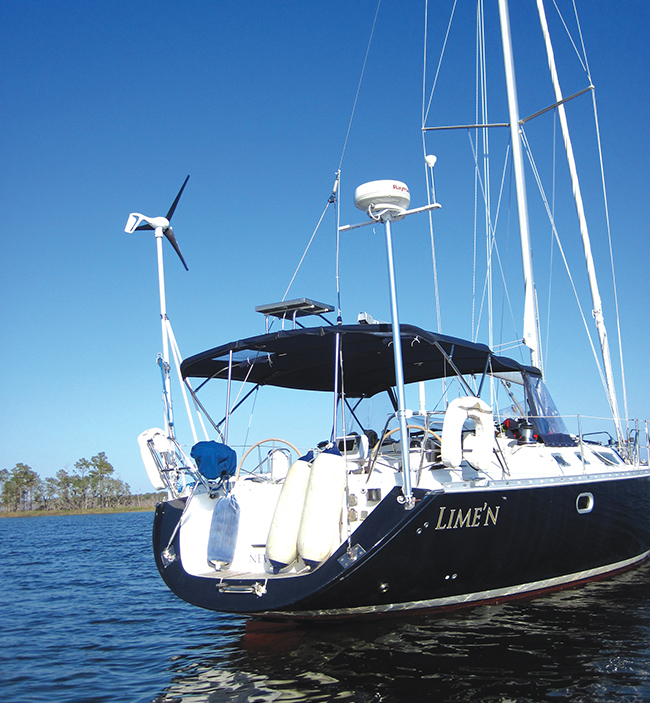 The afterdeck is quite wide and has large lazarettes for stowing lines, fenders, and gear. There are two seats aft built into the pushpit and a gate to the swim platform. 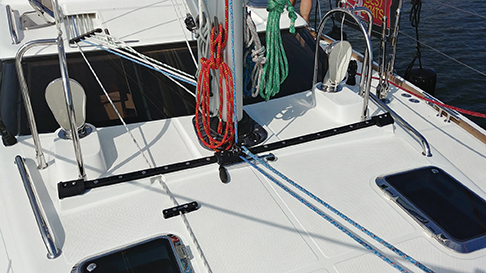 Two stainless steel handholds on either side of the swim platform will make landing a dinghy easy and provide an aid for folks climbing aboard. Up forward is the chain locker and vertical-axis windlass. The chain locker is divided in two so you can keep two rodes always at the ready. 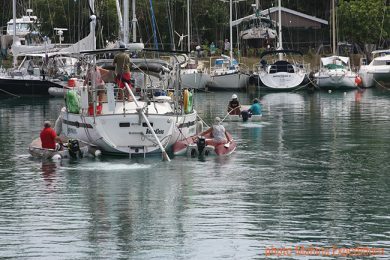 The bow has two anchor rollers so setting up a second anchor in bad weather will be a cinch. 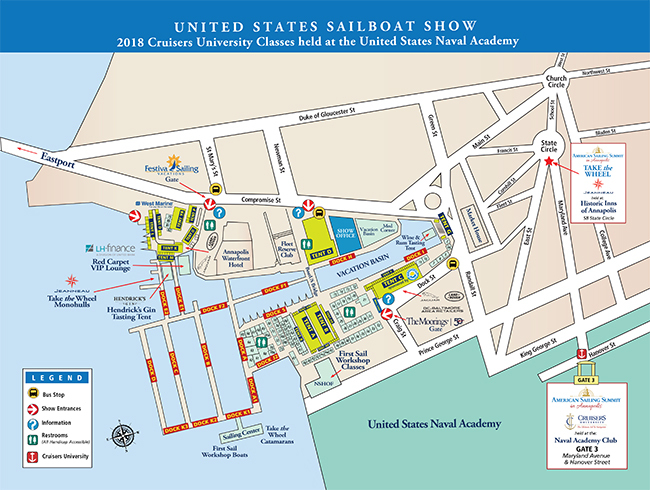 There will be many cruisers who will have two anchors and rodes always mounted and ready. The whole deck area at the bow is covered with a stainless steel sheet that protects the fiberglass deck from the chafe of anchor chain and makes cleaning up after a muddy anchor simpler. 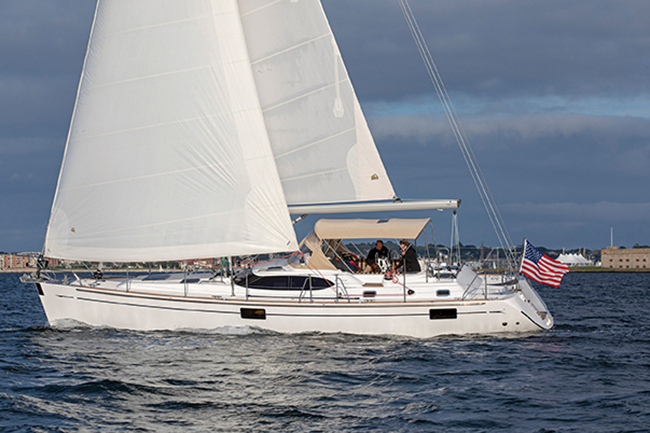 The 48 is a fine sailing cruising boat that is easy for a couple to handle. The cockpit is well protected from the elements so standing night watches won’t be a chore. With all lines led aft, one watchstander can reef and trim by herself. 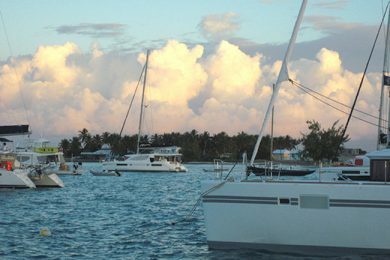 The staysail, which we didn’t use, provides a number of sail plan options that will be ready to be deployed in a wide range of weather and sea conditions. 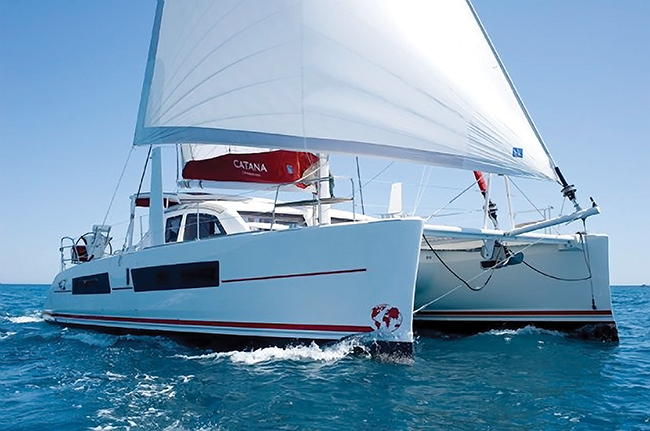 In short, the new Hylas 48 is set up for a couple to explore the world in style, comfort and safety. There is something about boats at the luxury end of the market that makes them distinctive. Such details might be the deep gloss of the varnish on a burled walnut saloon table or the deep satin finish on the teak and holly soles or the matching grain and rubbed effect varnish on all cabinets and doors. You know a lot of care, a lot of expense and a lot of man hours were involved to get this superb finish. That’s the impression you have when you first climb down the 48’s companionway ladder to the saloon. The 48 is a three-cabin boat with a huge master stateroom aft, a great double guest cabin forward and a pullman cabin with two bunks just aft to port. 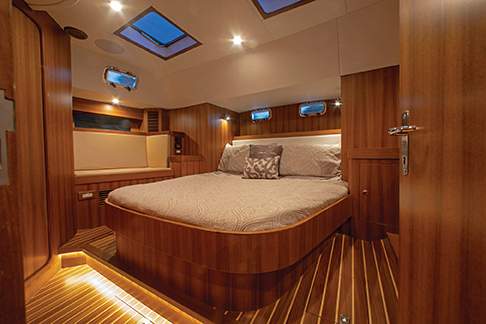 The master cabin has its own large head with a separate shower stall. The boat’s owners could move in here and expect to live comfortably for years. The two forward cabins are served by a single head with a phone-style shower mounted at the sink. The galley is in the passageway that leads aft to the master stateroom, so it has a ton of counter space, storage and room for two large under counter fridge-freezer units. The twin sinks are nearly on the centerline so they will drain properly on both tacks. This is one of the handiest and best laid out galleys you will find in a boat under 50 feet and will work extremely well when making offshore passages. The saloon has a curved dinette to port with the burled walnut table. Three or four can sit here for meals and a portable bench seat can provide seating for two more. To starboard there is another bench settee with storage behind it. The chart table is large and old-fashioned, just the way a lot of skippers like it. 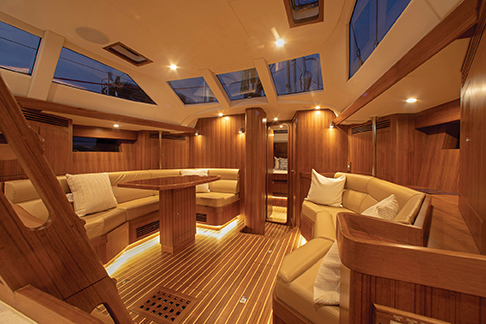 The table is wide enough to spread out a folded chart or ChartKit and inside it’s roomy enough for all of the nav gear you need, plus cruising guides, a laptop computer and sundry tools. 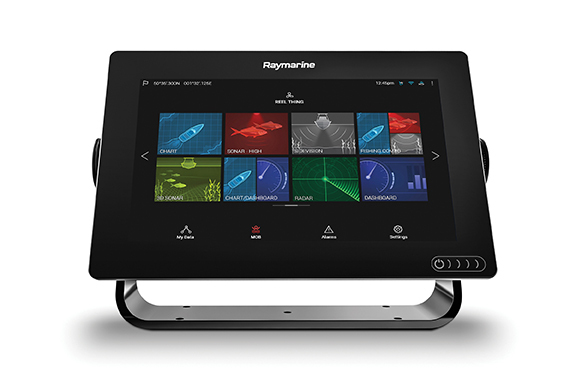 The electrical panel is as comprehensive and as well labeled as you will find on any yacht. When it comes time to troubleshoot systems, you will start here with a distinct advantage. There are handy vertical spaces at the chart table for mounting instruments, radios, modems, tank monitors and the control heads for a watermaker and genset. The 48 carries 119 gallons of water, which is a generous amount for a boat of this size. But it was assumed, I suspect, that all owners will add a watermaker so the tanks do not need to be huge. That said, it is also assumed that owners will sail far and wide and will cross oceans from time to time, and will use the gen set regularly, so tankage for 290 gallons of diesel fuel has been squeezed into the hull. The 75-horsepower Yanmar will burn about three quarters of a gallon an hour at six knots. Keeping a 10 percent fuel safety margin, the remaining 260 gallons will give you a maximum motoring range of over 1,500 miles. That is three times the range recommended by most offshore rallies that cross oceans. 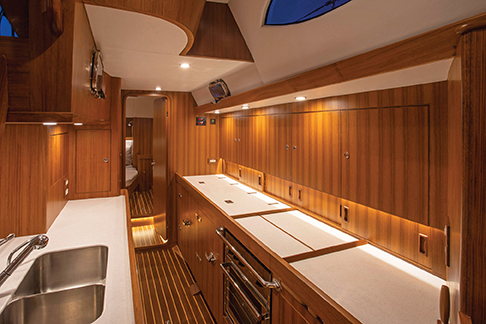 The new Hylas 48 is a classy addition to the Hylas line and to the cruising fleet in general. There are not many boats these days under 50 feet that fit the “luxury” category but this is certainly one. 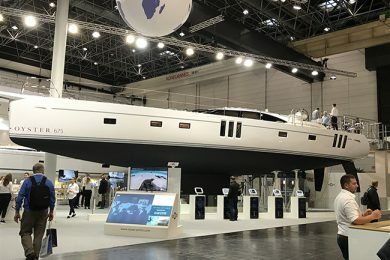 And, as the first new boat from the Hylas 2.0 company, it gives a great foreshadowing of what’s to come when larger designs emerge in the months and years ahead.